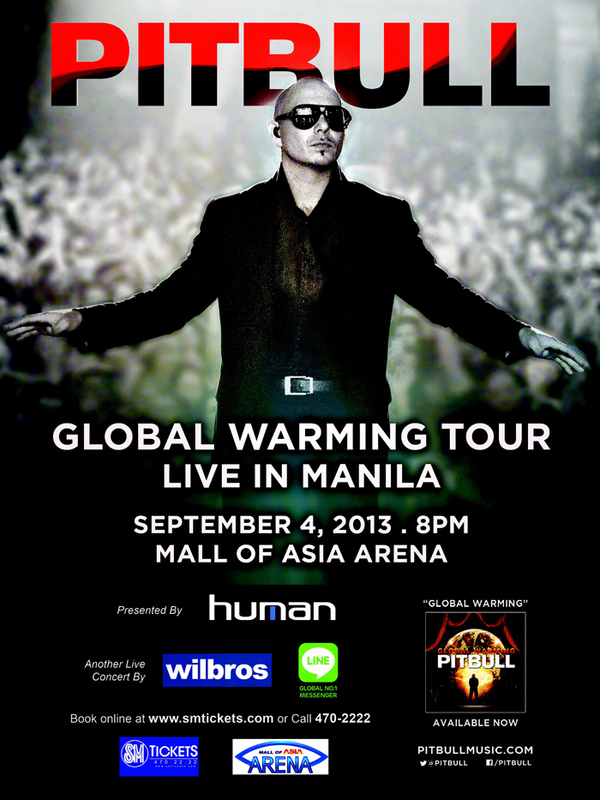 PITBULL Global Warming Tour 2013 in Manila! From just rapping on mix tapes and club appearances in Miami, Pitbull has now become one of the world's biggest & sought after artists. He has collaborated with big names like Jennifer Lopez, Christina Aguilera, Enrique Iglesias, Usher and many more. His success could be measured by his 5 million album sales, 40 million singles worldwide, #1 hits in more than 15 countries and 3 billion video views. You already Pitbull. Hehe. But wait there's more! His world tour concerts were all sold out in Latin America, Canada and Europe, before bringing the party to the United States, Japan and Australia. For more information about the concert, call Wilbros Live at 374-2222. This concert is presented to you by HUMAN and Wilbros Live. You can buy tickets through SM Tickets outlets or at www.smtickets.com Call 470-2222 for more inquiries.